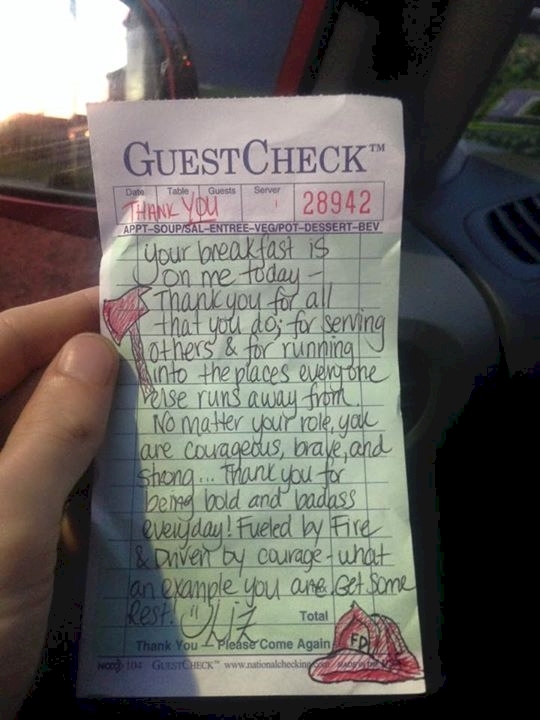 A Waitress Wrote On A Receipt. But When She Checked Her Facebook Later, She Almost Fainted..
One meal for a pair of firefighters turned into a fateful decision because of a simple act of kindness. After spending 12 hours supplying water to a warehouse fire, Tim Young realized his friend Paul Hullings hadn't eaten, so they hit up Route 130 Diner in Delran, New Jersey for breakfast. Their waitress, Liz Woodward, happened to overhear them talking about the blaze Paul had been working at. 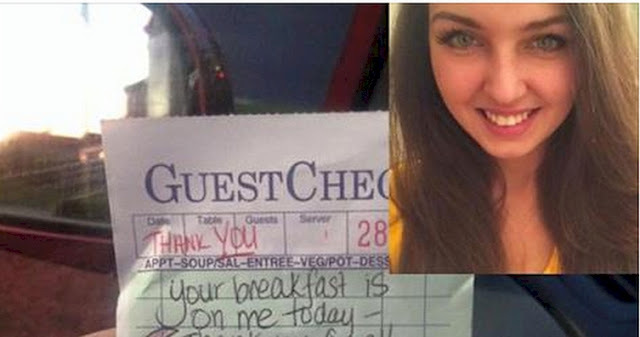 When it came time to pay the bill, she delivered a note instead. "Your breakfast is on me today..."
His heart warmed by the gesture, Young wrote about his trip to the diner on his Facebook page and encouraged his followers to support the diner and, "if Liz happens to be your waitress, tip big." The story doesn't end there, however. 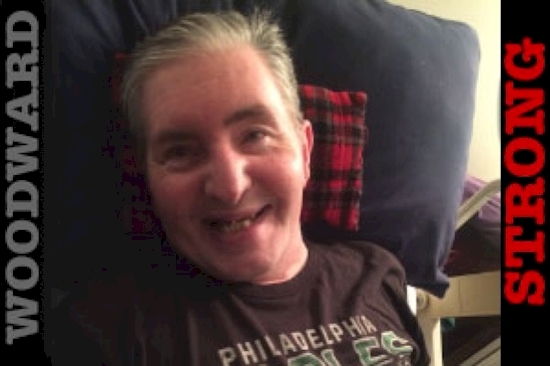 People started sharing the story around, and soon it came to Young's attention that Liz had started a GoFundMe campaign to raise money to buy a wheelchair-accessible van for her father after he suffered a brain aneurysm. Seeing that the woman who had been so kind to him was in need of help, he urged others to help out as well. 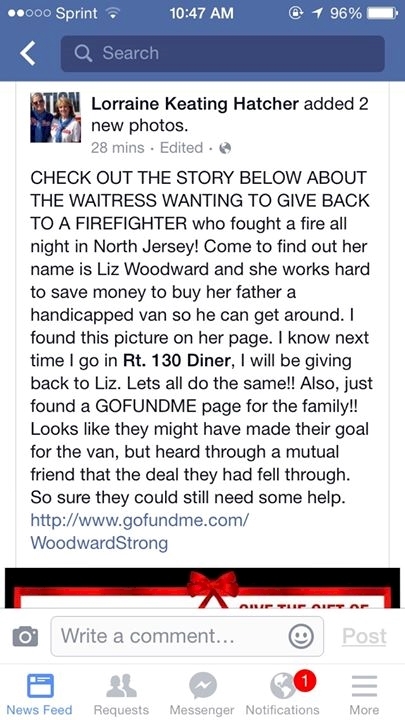 "Just found out the waitress, Liz, has been trying to raise money to buy a wheelchair accessible van for her [ill] father. Please help give back," he wrote. Her initial goal for the GoFundMe campaign was $17,000, but after the deal fell through, she found herself in need of more funds. But when news of her act of kindness to two hungry firefighters got around, and attracted the attention of ABC News, donations started rolling in. At the time of writing, the "Woodward Strong" campaign had raised $70,252 from 1,221 donors, many of whom cite her act of kindness when they donate. The campaign to buy Liz's father a wheelchair-accessible van continues. In turn, Liz included her side of her encounter with Young and Hullings in an update to the GoFundMe campaign. "I paid for breakfast by paying respect to two firemen because of what ALL firemen are called to do," she wrote. "They weren't fighting that warehouse fire - Tim wasn't even there, and Paul and his crew were helping to supply water. That's why the note read 'No matter your role...'"
Better still, she continues to encourage others to pay it forward and be kind. "Please know - good people are EVERYWHERE. If you can't find one, BE ONE." She hasn't been able to buy the van just yet—customized vans can cost in excess of $80,000—but she's extraordinarily thankful, and says she's working on "an awesome project".